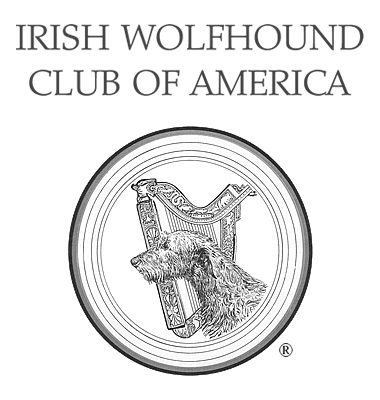 Irish Wolfhound Breed Standard - Irish Wolfhound Club of America, Inc.
Head – Long, the frontal bones of the forehead very slightly raised and very little indentation between the eyes. Skull, not too broad. Muzzle, long and moderately pointed. Ears, small and Greyhound-like in carriage. Neck – Rather long, very strong and muscular, well arched, without dewlap or loose skin about the throat. Chest – Very deep. Breast, wide. Back – Rather long than short. Loins arched. Tail – Long and slightly curved, of moderate thickness, and well covered with hair. Belly – Well drawn up. Forequarters – Shoulders, muscular, giving breadth of chest, set sloping. Elbows well under, neither turned inwards nor outwards. Leg – Forearm muscular, and the whole leg strong and quite straight. Hindquarters – Muscular thighs and second thigh long and strong as in the Greyhound, and hocks well let down and turning neither in nor out. Feet – Moderately large and round, neither turned inwards nor outwards. Toes, well arched and closed. Nails, very strong and curved. Hair – Rough and hard on body, legs and head; especially wiry and long over eyes and underjaw. Color and Markings – The recognized colors are gray, brindle, red, black, pure white, fawn or any other color that appears in the Deerhound. Faults – Too light or heavy a head, too highly arched frontal bone; large ears and hanging flat to the face; short neck; full dewlap; too narrow or too broad a chest; sunken or hollow or quite straight back; bent forelegs; overbent fetlocks; twisted feet; spreading toes; too curly a tail; weak hindquarters and a general want of muscle; too short in body. Lips or nose livercolored or lacking pigmentation. Thighs long and muscular; second thighs, well muscled, stifles nicely bent. Coat, rough and hard, especially wiry and long over eyes and under jaw. Body, long, well-ribbed up, with ribs well sprung, and great breadth across hips. Ears, small, with Greyhound like carriage. Note – The above in no way alters the "Standard of Excellence," which must in all cases be rigidly adhered to; they simply give the various points in order of merit. If in any case they appear at variance with Standard of Excellence, it is the latter which is correct.